Recently at Aegis of Issaquah, our sous chef surprised our residents with his family’s five new Golden Retriever puppies. These energetic balls of yellow fur and unlimited licks cuddled, played, and visited with our residents for the afternoon. As you could see from their smiles, the joy of a puppy doesn’t fade with age. In fact, research has proven that a pet can have many health benefits not only for the elderly but everyone. Pets offer more than just companionship and unconditional love. 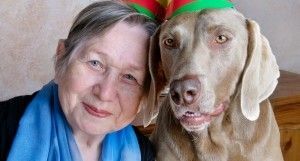 Studies have found that pets boost health and wellbeing, especially in the elderly. Because of their many benefits, Aegis Living has house dogs in most of our communities and offers a pet-friendly policy for our residents who own pets. Animals can help to normalize an environment and put others at ease. Aegis Living has found that pets encourage more interaction among our residents through joy, laughter, and shared memories of past pets. In Washington, Aegis Living had partnered with Dr. Rahul Khurana, a board-certified geriatric psychiatrist. His goal is to maximize the functionality and quality of life of our aging residents, who may be suffering from depression, anxiety, or dementia. He is accompanied on his visits by B.B., his certified therapy dog through the Pet Partners Program. B.B. is a calming, gentle, and reassuring companion who helps soothe and reduce anxiety in many of our residents. Improved communication – some who are unresponsive may chat with a pet. Increased exercise and physical activity – many will walk further when walking with a dog. The University of Missouri-Columbia found pet therapy generated hormones that positively affect a person’s mood. A study by Rebecca Johnson, Ph.D., RN shows that when an individual pets a dog for a few minutes they will get an immediate release of “feel good” hormones – such as serotonin, beta endorphin, prolactin, and oxytocin. The result is you feel happy, and your cortisol (stress hormones) will decrease which can significantly help with depression. A loving, furry companion or a visit with Fido may just be what the doctor ordered to boost your mood!